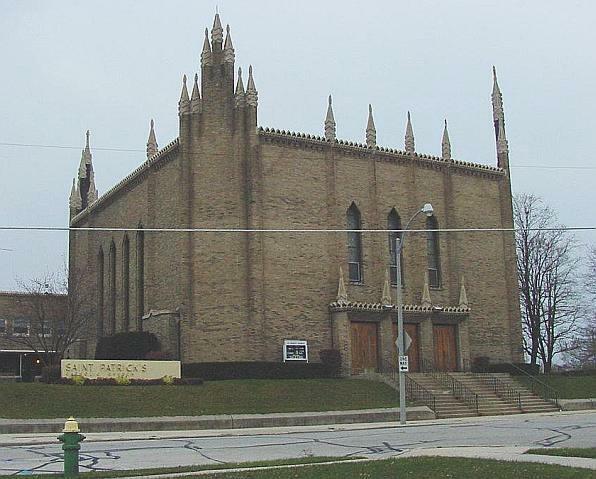 St. Patrick’s, Racine, was the first of Byrnes churches to abandon the rectangular shape altogether. The ceiling is suspended without supporting pillars giving the interior a spacious and integrated character. It appearance today seems like a simple square and does not give the impression of being a radical step in church design. 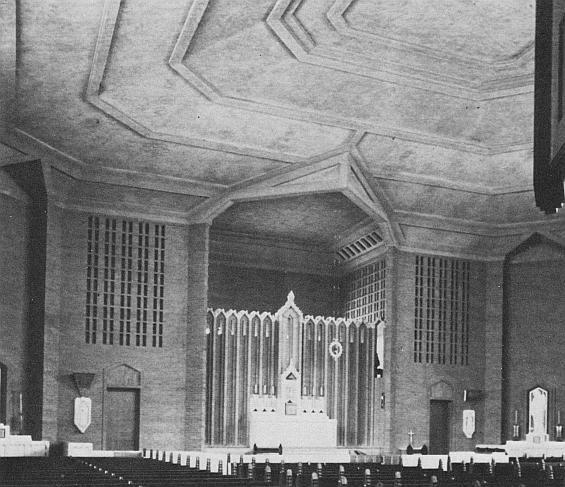 But when the church was commissioned, Father William McCarthy, “of the fighting Irish type”, in Byrnes words, was able to persuade the Milwaukee Diocese to accept the design despite considerable opposition. The square-like shape unifies the length and width of 80ft and makes St. Patrick’s the first square-shaped Catholic church. The purpose of the square design is to unify the nave and sanctuary and break from the older rectangular tradition. The original altar (above b&w image) had a reredos in front of a rear alcove. This has since been renovated to create space behind the altar and modernise the design for Vatican II changes. Like St. Thomas the Apostle, Chicago, the choir gallery is located behind the altar and due to the awkward locations, the gallery is today used for storage purposes. The renovations have destroyed what was a wonderful brick reredos and high altar, reflecting the tall and narrow chevron-tipped designs of Barry Byrne. This may have been necessary as the existing altar was at the very edge of the sanctuary. It is a pity, that the reredos could not simply be moved back preserving the altar as it was and making space for a new modern altar. Instead a totally new altar was designed and integrated into the rear alcove and beautiful as it may be, it is not in par with the architectural theme of Byrnes design. The interior of this church features a strong usage of inset and side lighting. 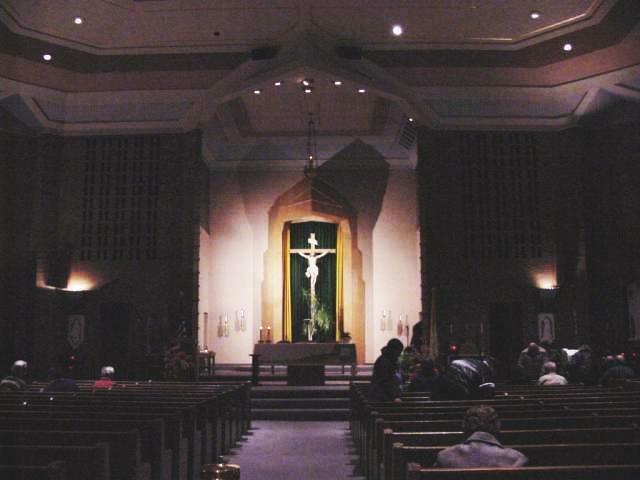 The stations of the cross are inset into the walls and are also individually lit. 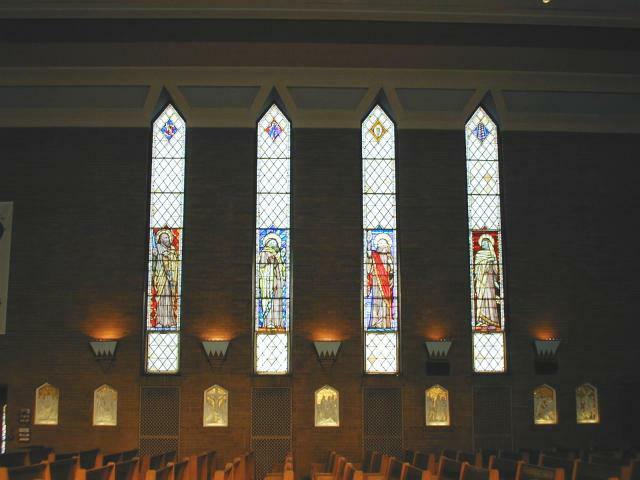 Natural light is provided by large stained glass windows featuring St. Patrick and other holy figures. The side lighting is cleverly provided by means of upturned lights seated on brick supports. The external finish is another excellent example of Byrnes clever handling of brick. The use of zig-zag patterns to form vertical piers that align with old-style buttress pillars, give a classical feel to this modern structure. The terra cotta decoration and patterned brick-work around the windows and roof, add an excellent finish and help in relaxing the horizontal lines. In one way, it takes the harsh square-like look away from the building. Our sincere appreciation is extended to Carol Lee Smith, Mequon, WI for taking these images. Carol drove some 90 miles on a freezing Saturday to take these images. Many thanks also extended to an anonymous protographer from Racine for an extensive series of images taken of both the interior and exterior of the church. 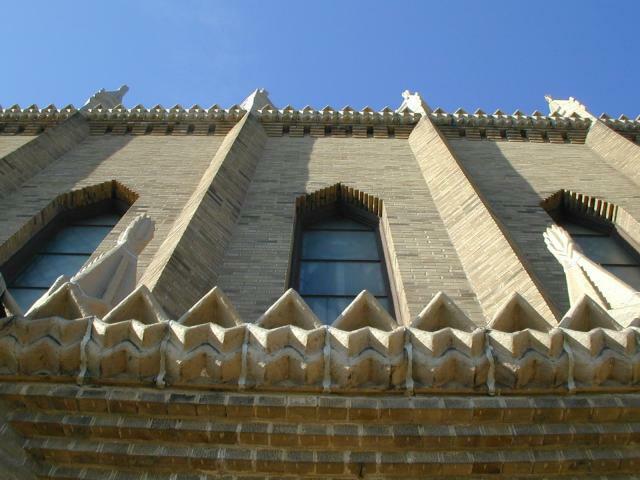 Many of his images feature interior ornaments and objects, depicting the zig-zag styles used throughout the church.